Surviving tales of Greek mythology often extol the beauty of the figures, both male and female, and mortal and immortal, that appear within them. The goddesses Hera, Athena, and Aphrodite would compete for the title of most beautiful through the Judgement of Paris; whilst mortals such as Helen, Cassandra and Psyche were also noted for their looks. Another beautiful mortal female was a princess of Aethiopia named Andromeda. Andromeda was the daughter of the king of Aethiopia, Cepheus, and his queen, Cassiopeia. ​Cepheus, via Belus, was the grandson of Poseidon, although the lineage of Cassiopeia is not elaborated upon. It is easy to think of the kingdom of Aethiopia as being that of modern day Ethiopia, but in antiquity it was an area of unknown, a land to the south of Egypt, but one which stretched from the furthest eastern extremes of the earth to the furthest west. 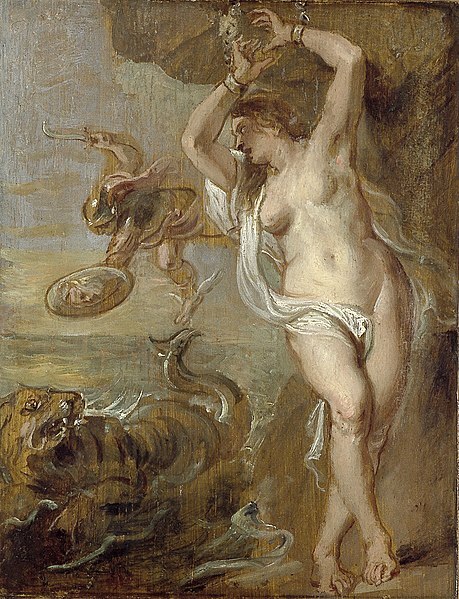 Andromeda would come to prominence when her story intertwined with that of the Greek hero Perseus. At the time when Perseus was questing for the head of Medusa, in Aethiopia Cassiopeia was making a rash proclamation, for the queen of Aethiopia would state that the beauty of Andromeda, and in some versions, herself, exceeded that of the daughters of Nereus. The daughters of Nereus were the 50 water nymphs collectively known as the Nereids. These water nymphs were renowned for their beauty, and the majority were to be found in the retinue of the sea god Poseidon. ​When the Nereids heard about the boast of Cassiopeia, they went en masse to Poseidon, and complained about the queen of Aethiopia. Poseidon listened to their complaints and decided to punish Aethiopia. This punishment took the form of a great flood, which destroyed much property and agricultural land, and Poseidon also sent forth Cetus, a sea monster which took the unwary from the shoreline. With his wife having angered the gods, Cepheus would visit the Oracle of Zeus Ammon at the Siwah Oasis to find out how to appease them. The news though was not good, for the priestess would state that Andromeda would have to be sacrificed to the sea monster. To appease the gods, and his own people, Cepheus had no choice but to tie his beautiful daughter to the rocks by the sea, and await the coming of Cetus. Andromeda of course does not die because at that time Perseus would fly over Aethiopia, having successful taken the head of Medusa, and spy the beautiful damsel in distress. The famous myth sees Perseus soaring down, and as Cetus appeared, the Greek hero would reveal the head of Medusa, turning the sea monster into stone. Alternatively, Perseus simply thrust his sword into the shoulder of the sea monster, killing it. 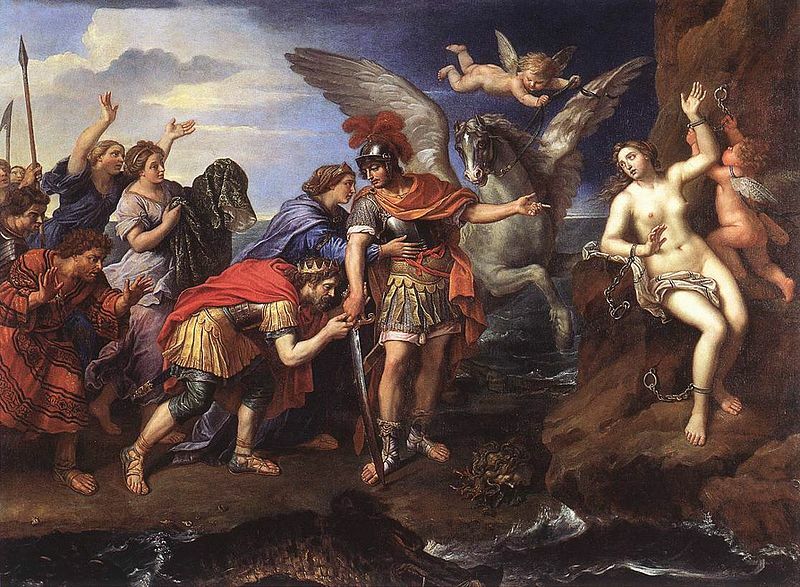 The rescue of Andromeda has been a popular story for painters for generations, in many painters Perseus is seen upon the back of the winged horse Pegasus, although in the original stories of Ancient Greece, Perseus flew because of the winged sandals of Hermes, rather than the winged horse. 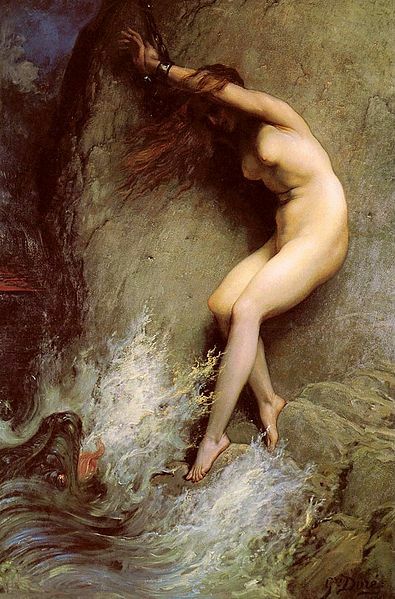 Having rescued Andromeda, and Aethiopia, from the sea monster, Perseus would claim the beautiful princess as his bride. Whilst still in Aethiopia, Perseus and Andromeda would wed, but at the subsequent wedding feast, the banquet would be interrupted by the arrival of Phineus and his followers. Phineus was the brother of Cepheus, and Andromeda had previously been promised to him. ​It was but a moment’s work for Perseus to vanquish Phineus though, for the Greek hero simply removed the head of Medusa from its satchel, and Phineus was turned to stone. Andromeda and Perseus would then depart together from Aethiopia. Andromeda would follow her husband first to Seriphos, where Perseus rescued Danae, and then onto Argos. Andromeda would nominally become the queen of Argos when Acrisius died, but as Perseus turned down the throne, this accolade went to the wife of Megapenthes. Megapenthes would swap the throne of Tiryns with Perseus, so Andromeda would follow her husband there, and then onto Mycenae, when Perseus founded that city. Andromeda would become mother to a number of children by Perseus. Seven sons were born to Andromeda, Alcaeus, Cynurus, Electryon, Heleus, Mestor, Perses and Sthenelus; and two daughters, Autochthe and Gorgophone. The Persians were said to be named after Perses, whilst through the line of Alcaeus, the hero Heracles came forth. After her death, Andromeda would be placed amongst the stars by the goddess Athena, and the Andromeda constellation would be joined by that of Perseus, Cassiopeia, Cepheus and Cetus.